Honeycomb cannot be left out in the open for any extended length of time, as it will draw moisture from the air and become a sticky, soggy mess. To prevent this, it should be stored in baggies within airtight containers. Dipping the candies in chocolate helps, and the chocolate-dipped candies will last several days, although it is best eaten soon after it is made. You can control the thickness of the honeycomb by selecting a pan size based on your preference. 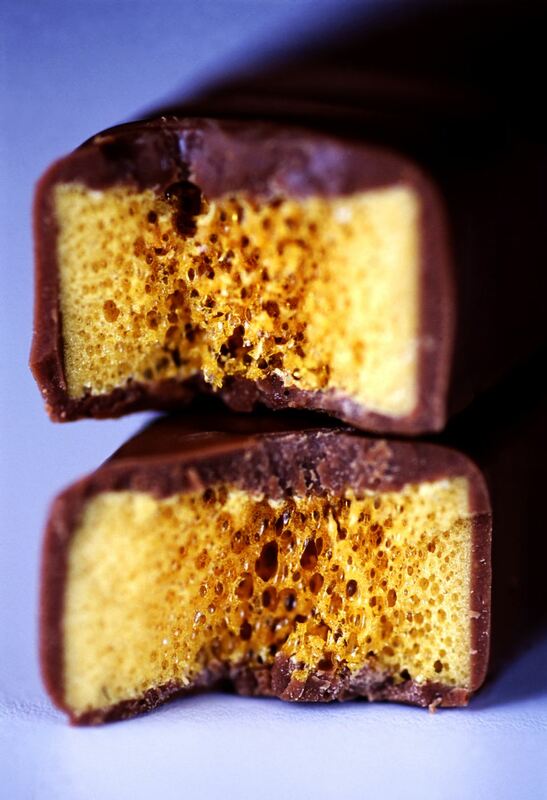 If you use an 11 by 17 pan, the honeycomb will be approximate 1/4-inch thick, while a 13 by 9 pan yields a 1/2-inch candy and an 8 by 8 pan produces an even thicker honeycomb. Prepare a rimmed baking sheet by lining it with aluminum foil and spraying the foil with nonstick cooking spray. Combine the sugar, corn syrup, honey, and 1/4 cup water in a large saucepan. You want to use a saucepan large enough so that the mixture can triple in size and still be safely contained. Stir the ingredients together until the sugar is completely moistened. Using a wet pastry brush, wipe the sides of the saucepan to remove any stray sugar crystals. Insert a candy thermometer and cook the mixture over medium-high heat, without stirring, until the temperature reaches 300 degrees F.
Once the candy is at the proper temperature, remove it from the heat and add the baking soda all at once. Immediately whisk the candy to incorporate the baking soda, and be careful—it will foam up a great deal! As soon as the baking soda is incorporated, pour the candy carefully onto the prepared sheet. Combine the chocolate and shortening in a microwave-safe bowl, and microwave it to melt the chocolate completely, stirring every minute. Note that the amount of chocolate required may vary depending on how thick you made your honeycomb and how many pieces you made. Using two forks, dip the individual pieces in chocolate so that they are completely covered, and replace them on the baking sheet. Repeat with remaining honeycomb and refrigerate until chocolate is set. Best enjoyed within 24 hours.